This step by step lesson explains and illustrates the technique used to paint the apples from our Still Life Painting lesson. By following the illustrated stages below we lead you through the key points of their painting technique from the flat underpainting of their shapes to the three-dimensional rendering of their form. 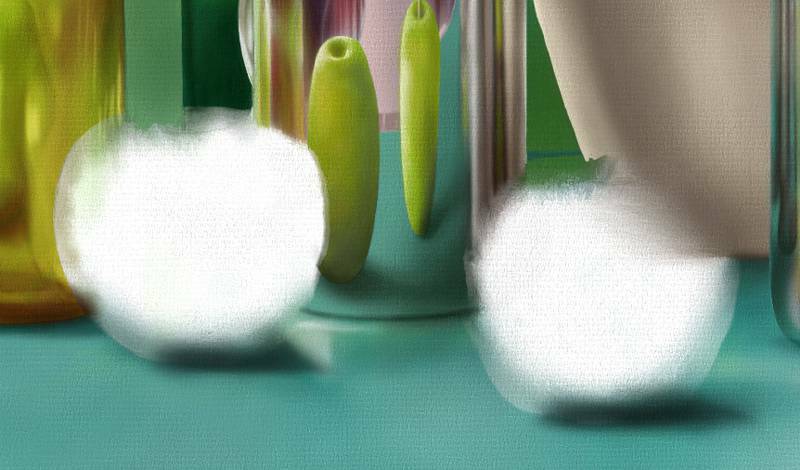 As a general rule, before you paint any still life object it is best to paint the background first. 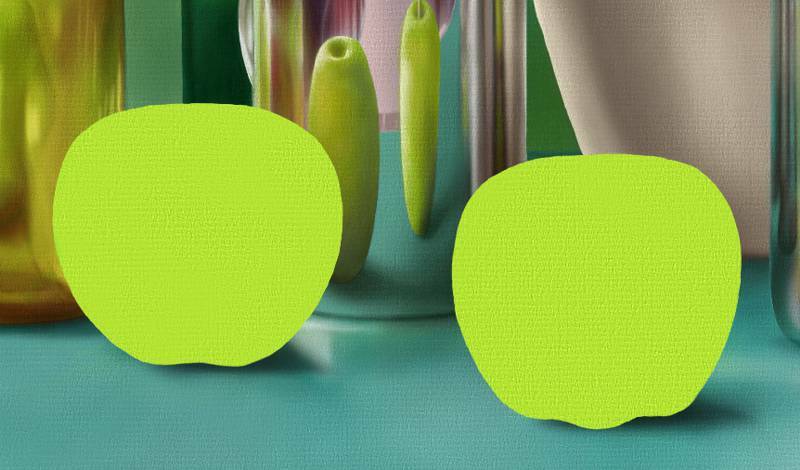 The apples are the last objects to be painted in our still life as they are positioned at the front of the group. They are also probably the easiest objects to paint due to their simple round form. Underpaint the apples with flat areas of local color. 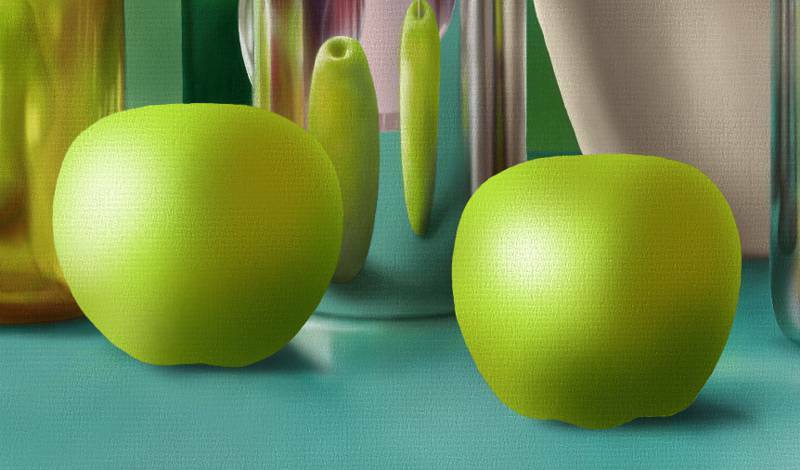 Start by underpainting the apples with flat areas of local color, taking care to accurately outline their shape. Apply the dark tones and highlights with thin glazes of color. Using a thin glaze of of dark transparent green, overpaint the layers of dark tones and blend them with a soft sable brush. Stipple and blend any subtle variations in the apples' skin color. Using a more opaque glaze of white, stipple and blend in the diffuse highlights that reinforce their solidity. Note the subtlty of the reflected light that creeps around the dark edge of the apples to gently enhance their form. Paint the dimples for the stems at the top of the apples. Using both light and dark glazes, paint the dimples and stems at the top of the apples. Finally, adjust and balance the highlights of the apples, and deepen the shadows that attach them to the foreground. When complete and viewed in the context of the surrounding still life objects, the apples take on a convincing realism with a strong presence at the front of the painting. Step 2: Underpaint the apples with flat areas of local color. Step 3: Apply the dark tones and highlights with thin glazes of color. Step 4: Paint the dimples for the stems at the top of the apples. 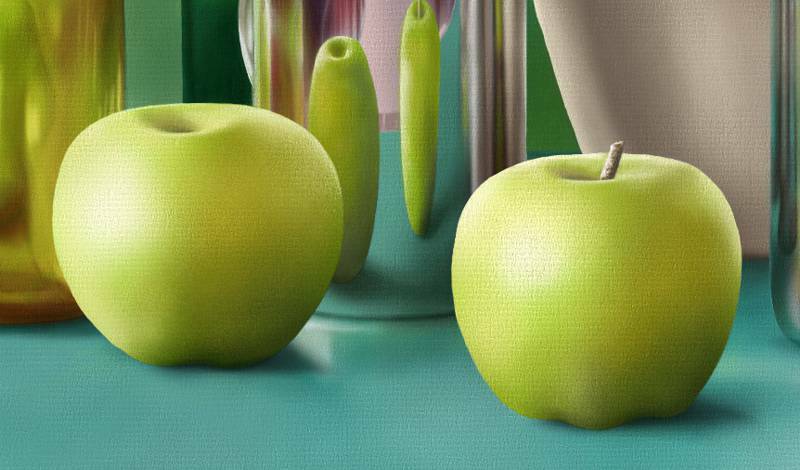 This still life slide show illustrates the step by step process of painting apples.